Dr. Randy Schekman, 2013 Nobel Prize laureate in Physiology or Medicine, is making significant contributions in promoting innovative research and education in the field of biomedical science at Yonsei University in Seoul, Korea, as a distinguished professor at the College of Life Science and Biotechnology as well as an advisory board member of the Yonsei-IBS Institute. World-renowned for his groundbreaking role in revealing the machinery that regulates the transport and secretion of proteins in cells, Dr. Schekman’s research introduced possibilities for preventing and treating a number of immunological disease and diabetes. He has contributed his knowledge and expertise through a lecture series, research seminars, and board meetings at Yonsei University, especially in collaboration with the acclaimed Yonsei-IBS Institute. Launched in 2015, the Yonsei-IBS Institute focuses on Yonsei’s key research and education programs in nanoscience and nanomedicine. The Institute houses the IBS (Institute for Basic Science) Center for NanoMedicine, which establishes a foundation for future-oriented convergence science and discovers breakthroughs at the nexus of nanomaterials and biological systems. Since his term at Yonsei, Dr. Sheckman has greatly contributed in ensuring the quality of research at the Institute, collaborating with Yonsei researchers on a sustainable research support system which includes research efficiency and evaluation as well as faculty appointments. 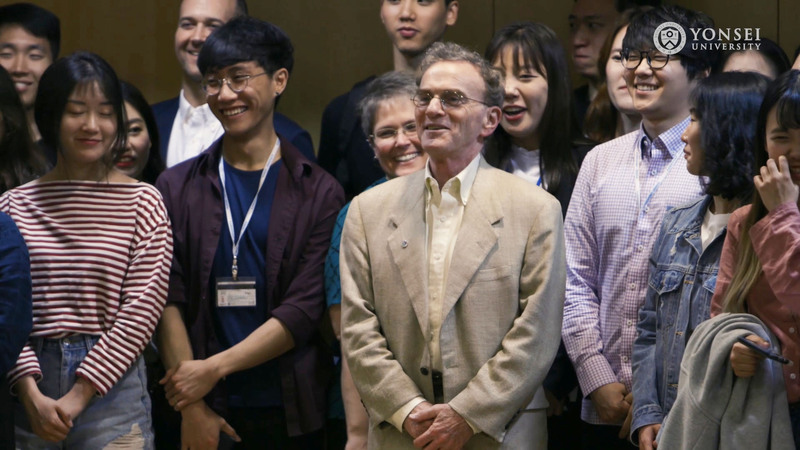 Dr. Schekman is also committed to inspiring the young minds at Yonsei University, engaging with young researchers as well as undergraduate and graduate students majoring in life science and biotechnology. He collaborated with faculty members and graduate students of the biology department on their current research work in intensive research seminars. In addition, Dr. Schekman presented his research discoveries on the sorting of small RNAs into exosomes secreted by human cultured cells in a special Nobel Laureate seminar at Yonsei, and gave a lecture series on membrane structure and function in relation to intracellular protein transport for the Yonsei community. His talks with undergraduate students addressed future careers in biomedical science, as well as prospects in pursuing graduate studies or studying abroad. Dr. Schekman reflects on his teaching and research experience at Yonsei University. Below is the full interview video. His most recent lecture at Yonsei University was for undergraduate students titled, “How Cells Export Proteins,” which was hosted by the College of Life Science and Biotechnology and Yonsei-IBS Institute. Dr. Schekman began his lecture by sharing the development of his own interest in science as a young child. He grew up in southern California and developed a keen interest in microorganisms when he was 12 years old. He had a toy microscope he received for his birthday and visited a river to collect a jar of pond scum to examine. He put a sample on a glass slide and was amazed at the world of microbiology he had seen. His father was rather skeptical by young Randy’s experience, as he was using a toy microscope, and so Randy decided to buy a real one with his own money. A real microscope cost 100 dollars and so he began to save the money he earned by doing chores, baby-sitting, delivering newspapers, and mowing lawns. However, his parents kept borrowing his money and he became so upset that he bicycled to the police station and told the duty officer that he was running away from home because his parents were stealing the money he was saving to buy a microscope. His father was called to the police station and met the captain of the police station; as soon as he came out, he drove Randy directly to the pawn shop of a nearby city and they purchased his very first real microscope, which became his pride and joy throughout his high school years. With this microscope, Randy found his passion to conduct individual projects and enter into science fairs and thus he became committed to studying microbiology. Dr. Schekman proceeded to share his experience at college and in the research labs, advising students that no single technique or approach is sufficient to solve an important problem; you need to have a multidisciplinary approach. He used the logic he had learned to address how cells export proteins as follows. Humans cells have around 23,000 genes that code for at least that many different protein molecules. All proteins are made inside of cells by ribosomes that stitch amino acids together to make long chains, sometimes thousands of amino acids long, that fold up in a compact structure to give each protein its unique function. A significant number of newly-made proteins end up outside of cells in the blood and lymphatic system (e.g. antibody proteins) where they travel around the body to help fight infection and convey information between the organs (e.g. insulin) in our body. These extracellular or secreted proteins are conveyed within the cell along a highway system called the secretory pathway. This highway is organized by a network of membranes that transfer proteins in capsules called vesicles from deep inside the cell to the cell perimeter. The last step in the chain of events involves the fusion of the vesicle membrane with the membrane surrounding the cell, resulting in the discharge of the interior content of the vesicle to the cell exterior. The broad outlines of the secretory pathway were established by pioneering electron microscope and cell fractionation experiments conducted by George Palade in the 1960s. Beginning in 1976, Dr. Schekman’s laboratory isolated a series of conditionally lethal, temperature sensitive mutations that block secretion at one of several sequential stages along the pathway established by Palade. Concurrently James Rothman’s laboratory established a cell-free reaction that reproduced vesicular traffic within the Golgi apparatus, and several of the proteins he isolated with this functional assay matched the Sec proteins Dr. Schekman had identified genetically. We now know that the mechanism of secretion is evolutionarily conserved over billions of years of life on earth. Using a cell-free vesicle budding reaction, his laboratory isolated a complex of Sec proteins that comprise a coat, COPII, responsible for cargo vesicle traffic from the endoplasmic reticulum. Among the other SEC genes identified in yeast, we discovered SEC61, which encodes the major channel forming subunit in the ER membrane responsible for polypeptide translocation into the secretory pathway. The evolutionary conservation of genes required for secretion allowed biotech companies to harness yeast as a factory for the secretion of useful quantities of human proteins. One-third of the world supply of recombinant insulin is made by secretion in yeast and the entire world supply of the Hepatitis B vaccine is manufactured in yeast cells. Dr. Scheckman explained that this is yet another example where basic science discovery has an important application in health and technology.